Get up close and personal with your innards with these 15 amazing 3D-body shots. Almost all of the following images were captured using a scanning electron microscope (SEM), a type of electron microscope that uses a beam of high-energy electrons to scan surfaces of images. The electron beam of the SEM interacts with atoms near or at the surface of the sample to be viewed, resulting in a very high-resolution, 3D-image. Magnification levels range from x 25 (about the same as a hand lens) to about x 250,000. Incredible details of 1 to 5 nm in size can be detected. Max Knoll was the first person to create an SEM image of silicone steel in 1935; over the next 30 years, a number of scientists worked to further develop the instrument, and in 1965 the first SEM was delivered to DuPont by the Cambridge Instrument Company as the "Stereoscan." 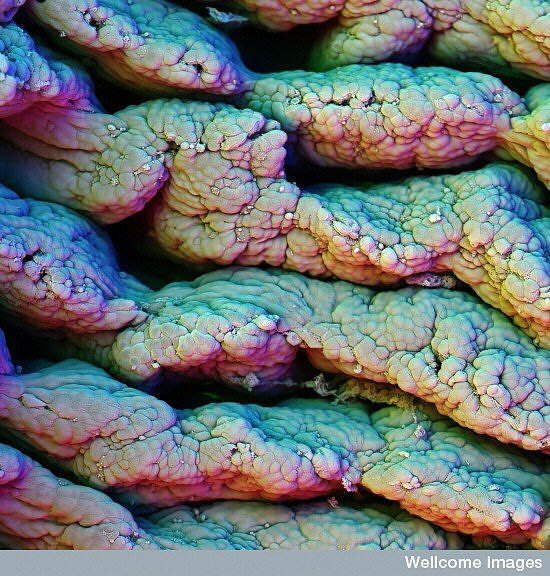 Here you'll experience the power of SEM in a journey of self-discovery that starts in your head, travels down through the chest and ends in the bowels of the abdomen. 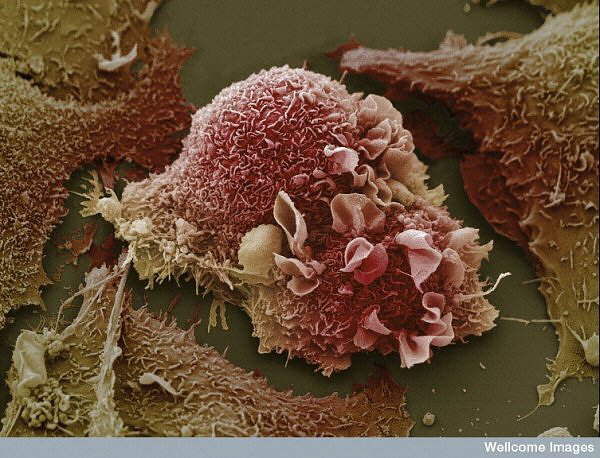 Along the way, you'll see what's normal, what happens when cells are twisted by cancer and what it looks like when an egg meets sperm for the first time. You'll never see yourself the same way again. 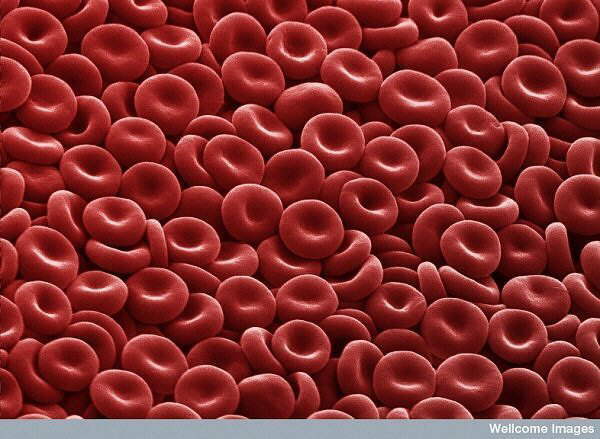 They look like little cinnamon candies here, but they're actually the most common type of blood cell in the human body - red blood cells (RBCs). 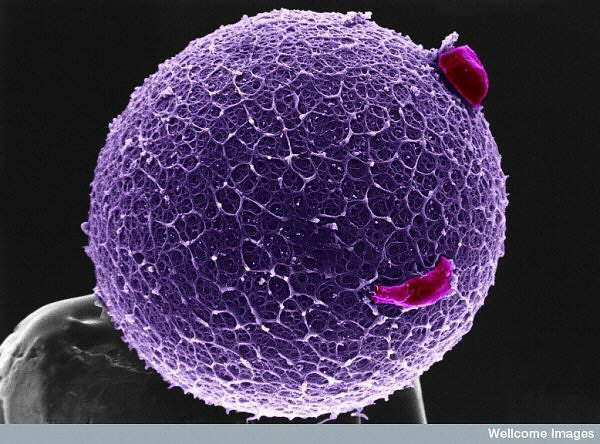 These biconcave-shaped cells have the tall task of carrying oxygen to our entire body; in women there are about 4 to 5 million RBCs per microliter (cubic millimeter) of blood and about 5 to 6 million in men. People who live at higher altitudes have even more RBCs because of the low oxygen levels in their environment. 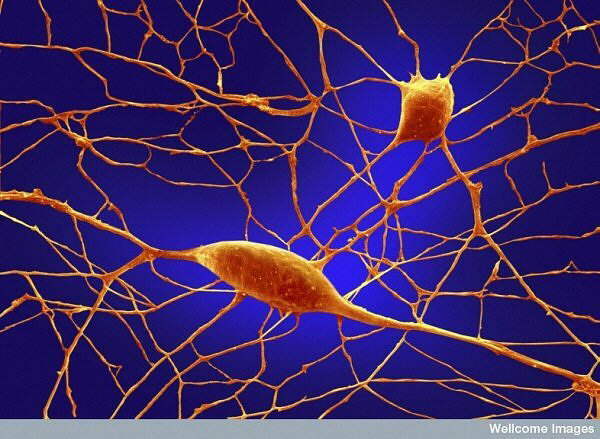 Of the 100 billion neurons in your brain, Purkinje neurons are some of the largest. Among other things, these cells are the masters of motor coordination in the cerebellar cortex. Toxic exposure such as alcohol and lithium, autoimmune diseases, genetic mutations including autism and neurodegenerative diseases can negatively affect human Purkinje cells. 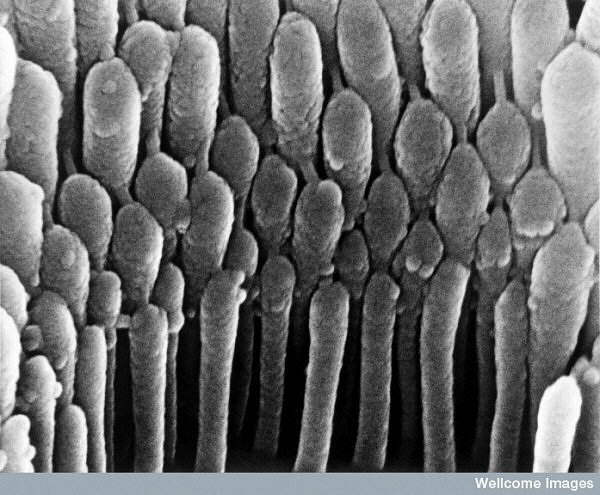 Here's what it looks like to see a close-up of human hair cell stereocilia inside the ear. These detect mechanical movement in response to sound vibrations. 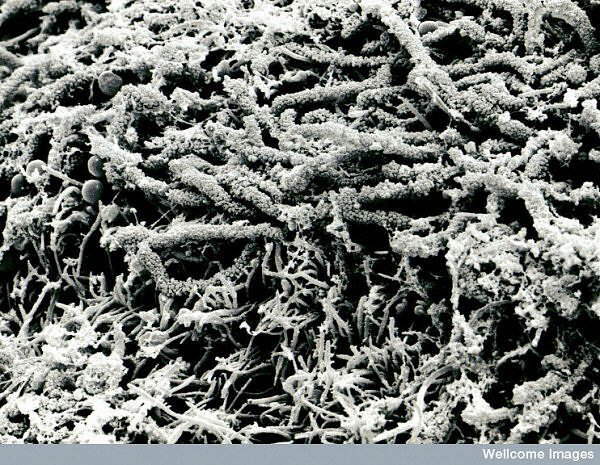 In this image, stained retinal blood vessels are shown to emerge from the black-coloured optic disc. The optic disc is a blind spot because no light receptor cells are present in this area of the retina where the optic nerve and retinal blood vessels leave the back of the eye. 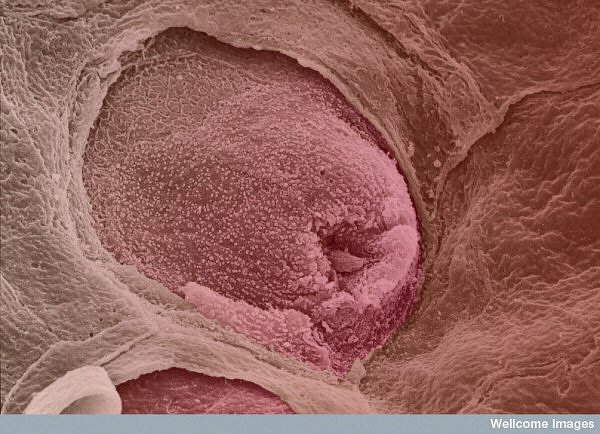 This colour-enhanced image depicts a taste bud on the tongue. The human tongue has about 10,000 taste buds that are involved with detecting salty, sour, bitter, sweet and savoury taste perceptions. 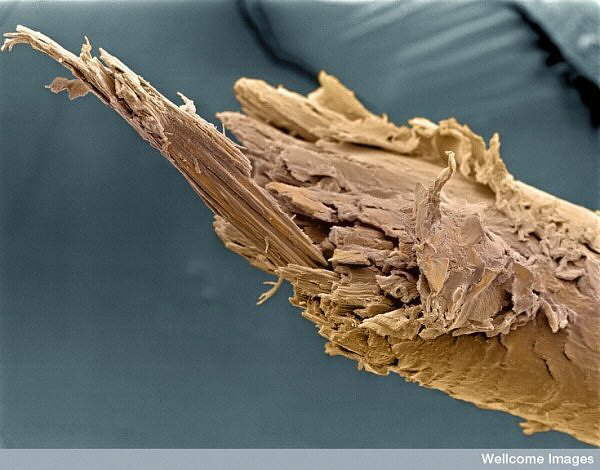 Brush your teeth often because this is what the surface of a tooth with a form of "corn-on-the-cob" plaque looks like. 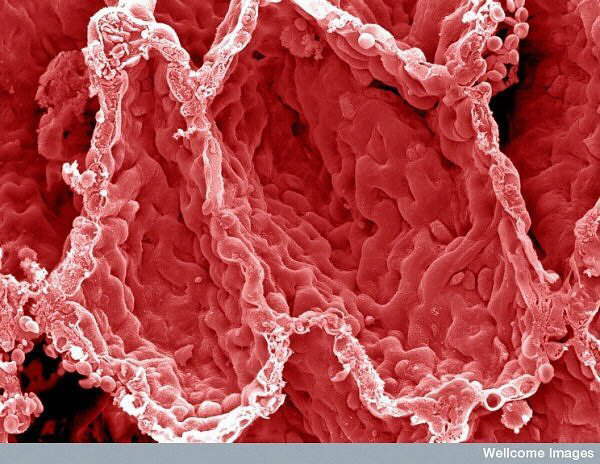 Villi in the small intestine increase the surface area of the gut, which helps in the absorption of food. Look closely and you'll see some food stuck in one of the crevices. 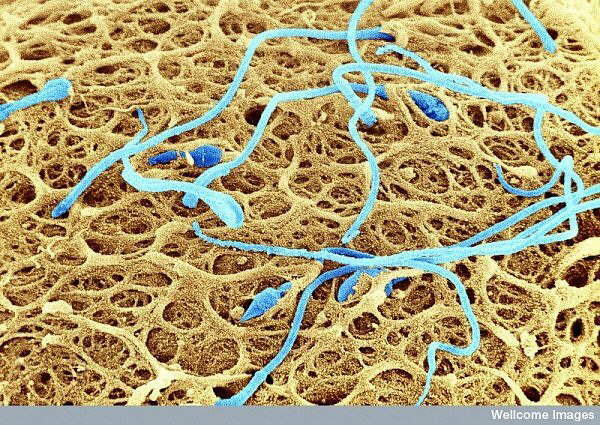 Here's a close-up of a number of sperm trying to fertilise an egg. It looks like the world at war, but it's actually five days after the fertilisation of an egg, with some remaining sperm cells still sticking around. 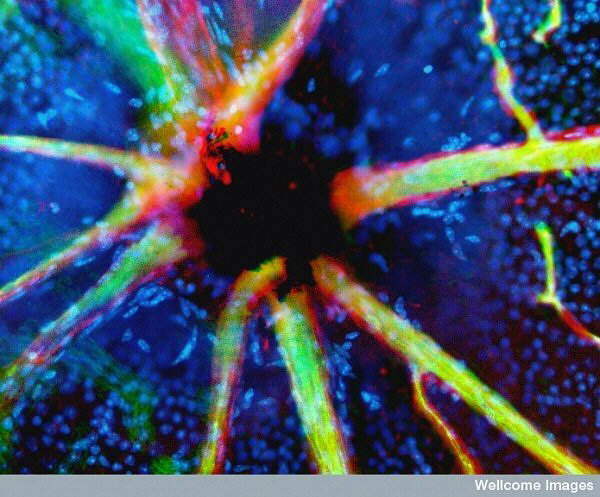 This fluorescent image was captured using a confocal microscope. 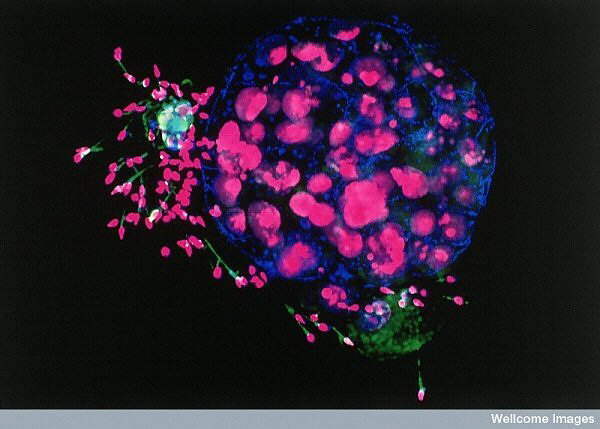 The embryo and sperm cell nuclei are stained purple while sperm tails are green. The blue areas are gap junctions, which form connections between the cells. 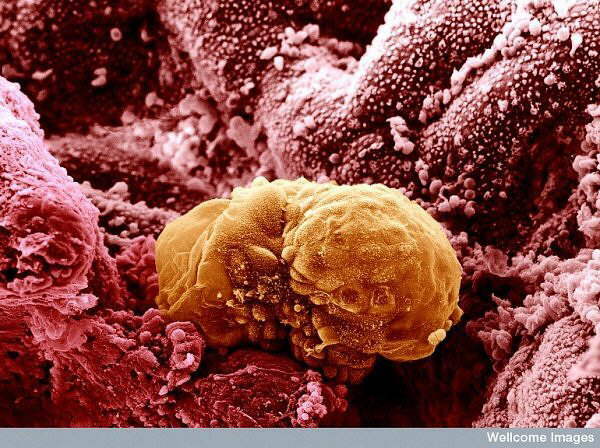 And the cycle of life begins again: this 6 day old human embryo is beginning to implant into the endometrium, the lining of the uterus.